It’s no secret that I often leave the sweet Lush products at the back of the cupboard. I don’t dislike them I just always tend to grab the fruity ones as those are the scents I am most comfortable with. 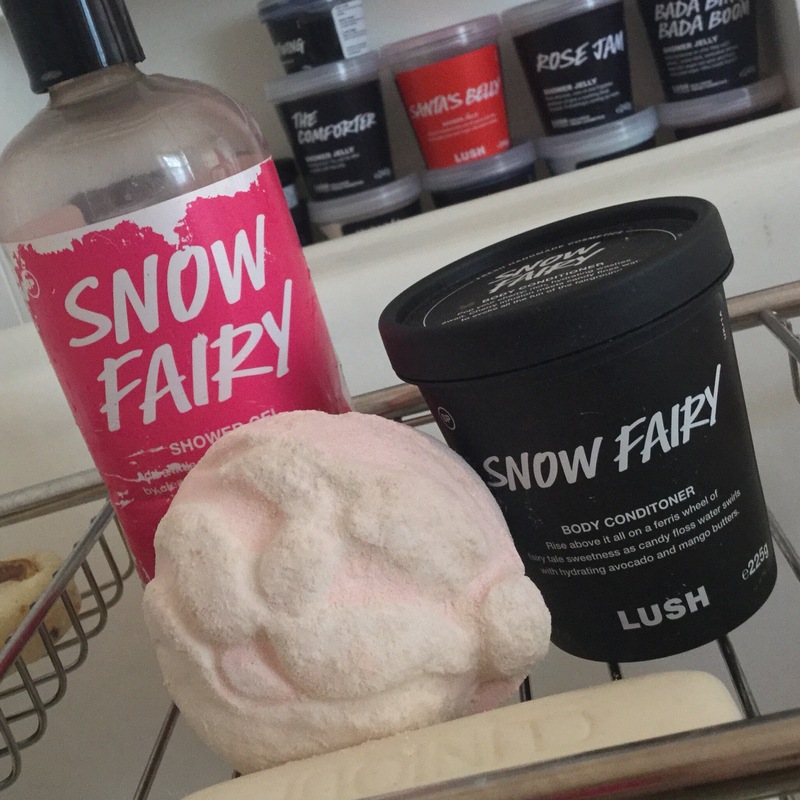 Adding to that, When I very first started my Lush adventure I never really understood the hype behind the Snow Fairy scent. Again, I don’t dislike it I just think there are much better Lush scents out there. Considering this, you can imagine my surprise when I one day woke up (4 or 5 months after Christmas) with the feeling that I really, really wanted to use something from the Snow Fairy product family. Luckily for me, my boyfriend loves the Snow Fairy scent meaning we had some Snow Fairy shower gel just hanging about. I’m not quite sure what had happened to me, or why I had suddenly started craving it but I realised then that I had warmed to and therefore opened the door for myself to explore a lot of much loved products that I’d previously never given much thought. 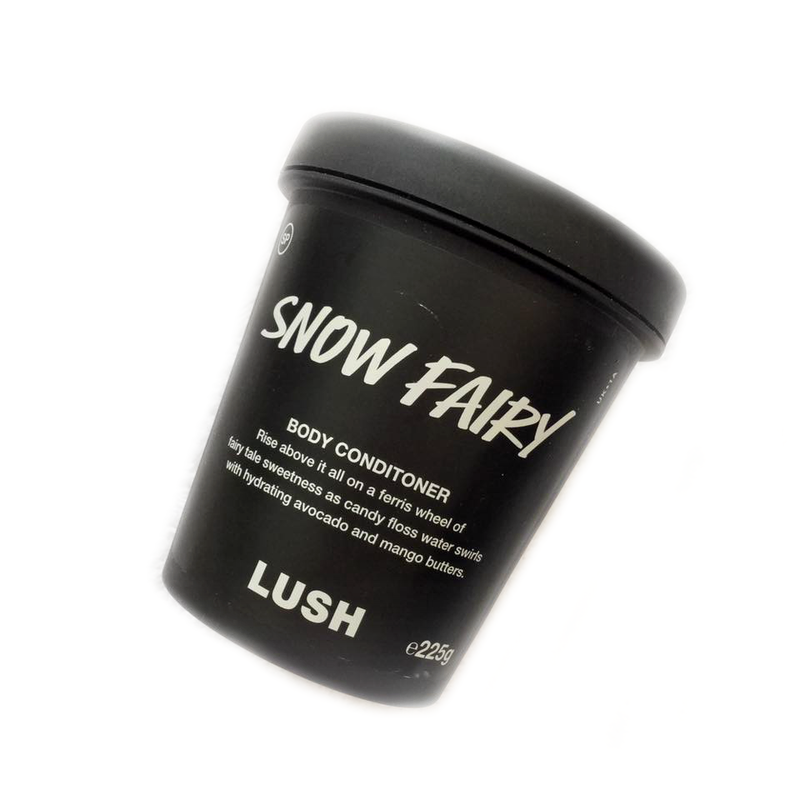 When I found out that Lush would be releasing a Snow Fairy Body Conditioner this winter I will admit to getting a little bit excited. In previous years Lush had released only one body conditioner in their winter line, Christingle. I absolutely adore Christingle but I cannot comfortably use it in the winter time due to how refreshingly cold it is, this meant that being given another much warmer option made me very happy indeed. Snow Fairy body conditioner has a super smooth, creamy texture that is very similar to perfectly made, smooth custard. It is a beautiful shade of baby pink and because I love pink so much I really have to fight the urge to just tip it all over me. As lovely as that would be, it would be such a waste as a little of the product goes such a long way. Tipping it all, all over me although very tempting isn’t at all necessary. When using a body conditioner I always begin with a little of it in my hand, I then work it into my body in a similar way to how you would do a shower gel, focusing a little bit more on the dry patches of my skin as well as the other bits of my skin that need a little bit of TLC and attention. After application you then also rinse it off just like you would shower gel, although I advise that you do not go crazy with the rinsing off, leaving a small amount of it on is the same as applying a body lotion. It soaks into your skin very quickly leaving your skin looking and feeling healthy, hydrated and luxurious. Now that we are in the winter season I can get my hands on a great range of Snow Fairy scented products. Above is the body conditioner, the shower gel and the Father Christmas bath bomb. They all share the Snow Fairy scent and I am enjoying layering up the scents so much more than I did last year. I have yet to review the bath bomb or shower gel, I will however have them posted on to my blog very soon. I may wait until December to publish my Father Christmas bath bomb review though as I am not quite ready to embrace Christmas just yet, I’ll stick to just the winter orientated products for now. There really is a huge list of Snow Fairy products that I still have yet to explore. Keep on the look out here as I will be reviewing Lush galore over the next 4 months. All I know is, is that I am going to smell absolutely fabulous! I couldn’t quite believe my eyes when I very first see the huge pile of Monsters’ Ball bath bombs at 2016’s Lush Creative Showcase. At the time I was so taken back by its quirky-cartoonish design that I completely missed the fact that it is Calacas scented. 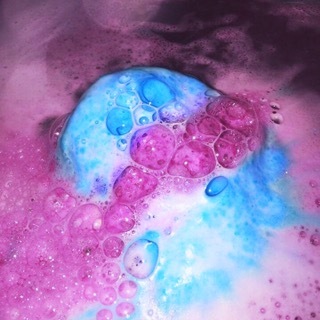 To my delight the Monsters’ Ball bath bomb not only smells identical to one of my favourite Lush Kitchen bath bombs the, The Enchanter Bath Bomb but it also puts on quite the colourful bath time show. Other Calacas scented bath bombs such as the Skullduggery although very pleasant, do not have the same wow factor in the water when it comes down to bath art. 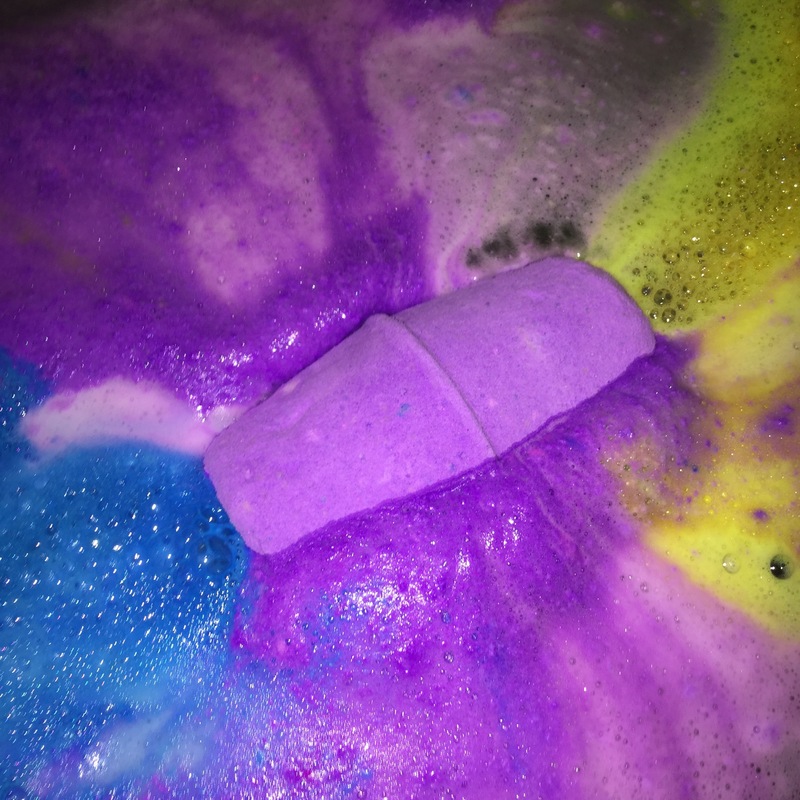 As soon as you place the Monsters’ Ball bath bomb into your bath water it starts to hiss, an explosion of purple foam fizzes out of it as it bobs and rolls around the waters surface. The water instantly feels silky smooth, my skin laps it up. You can’t help but lay back, relax and enjoy all of its beauty with every single one of your senses. Monsters’ Ball contains both lime and neroli oil. My first Lush memory of neroli oil is from the Frozen bath bomb. I wasn’t sure of it at first but I have grown to love its scent. Neroli is a really bitter scent when on its own. In Monsters’ ball the bitterness of the neroli is however completely washed out by the lime oil. The lime oil rounds off the neroli ingredient giving Monsters’ Ball a sweet, much lighter and somewhat warming citrus-scent. 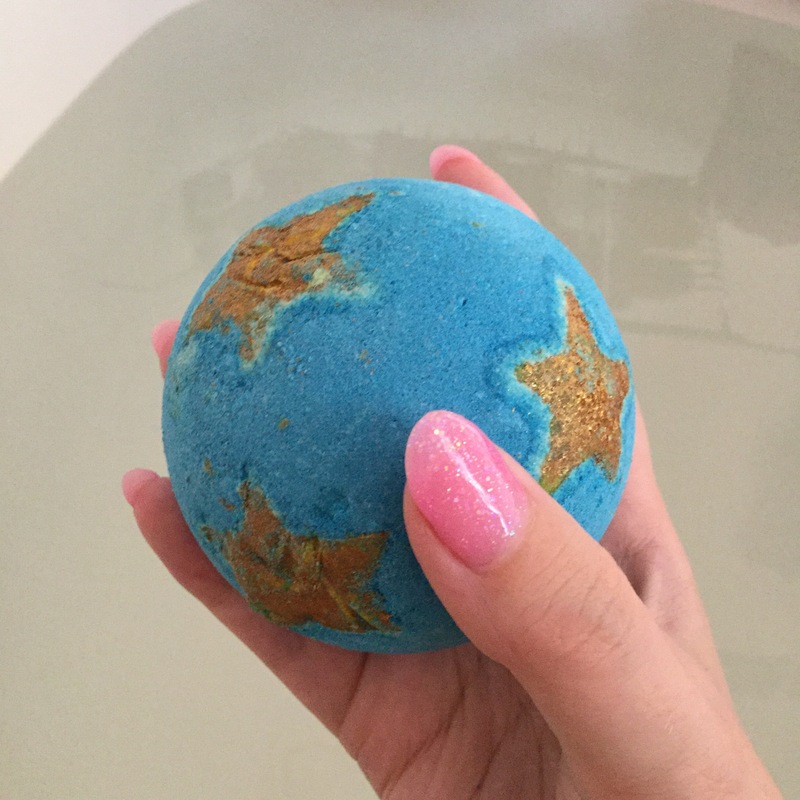 Neroli oil has been scientifically proven to increase the levels of serotonin (the happy hormone) in your brain, therefore if you need a bath that will boost your spirits Monsters’ Ball is a good bath bomb to go for. Once the bath bomb has been in the water for a little while it begins to spin, creating even more beautiful purple foamy patterns with blue streaks too. As the bath bomb dances around your bath, the water slowly turns a dark and sparkly purple colour. Its scent stays with you through out the bath and I can still smell it on my skin the next day. I can’t get enough of the Calacas scent, it’s so cheery and always lifts my mood. Monsters’ Ball may look ugly but it really is a fantastic bath bomb that I wish Lush had created and sold years and years ago. Not only does it smell fabulous but it also creates beautiful bath art that is sure to catch anyone’s attention. Just look at the photo below! The final thing I like about Monsters’ Ball is that its one eye is actual, vegan chocolate. I however wouldn’t recommend eating it, let your bath have the chocolate treat. Your skin will thank you for it I promise. When I very first heard the news that Lush Cosmetics were bringing out a body lotion called Sleepy I couldn’t help but stand to attention. As an ex insomniac, (yes I am one of the lucky ones who has been cured ~ for now anyway!) I still always feel the need to buy and test out every product that could potentially help me sleep. My worst nightmare (no pun intended) would be if my insomnia came back. This fear is what subconsciously drives me to always make sure I have a back up, get-me-to-sleep plan to turn to in the early hours of the morning should I find myself unable to fall asleep. The fear of not being able to sleep is always at the back of my mind. I don’t think I will ever be free of the fear completely but having non medicinal products that are more than likely able to help me sleep, makes me feel a lot better about it all. I feel as if I should explain my fear around sleep a little bit more because it’s not a very normal thing to worry about, if you don’t sleep, you don’t sleep. You’ll manage it for one day and because you haven’t slept last night you’ll sleep like a baby tonight, right? Wrong! Insomnia doesn’t work like that. Insomnia over a period of 10 years has done my body a lot of damage. Sleep is so very important. My lack of sleep is just one ingredient of the catalyst that caused me to get Fibromyalgia. Other things added to it too but since getting on top of my insomnia the Fibromyalgia has been a hell of a lot easier to deal with. I never, ever want to go back to being my worst because of not being able to sleep… Enter the most fantastic body lotion to ever be in my possession, Sleepy Body Lotion! My need for the Sleepy Body Lotion increased even more when I learnt that it was Twilight scented. Twilight and I are a match made in Lush heaven. 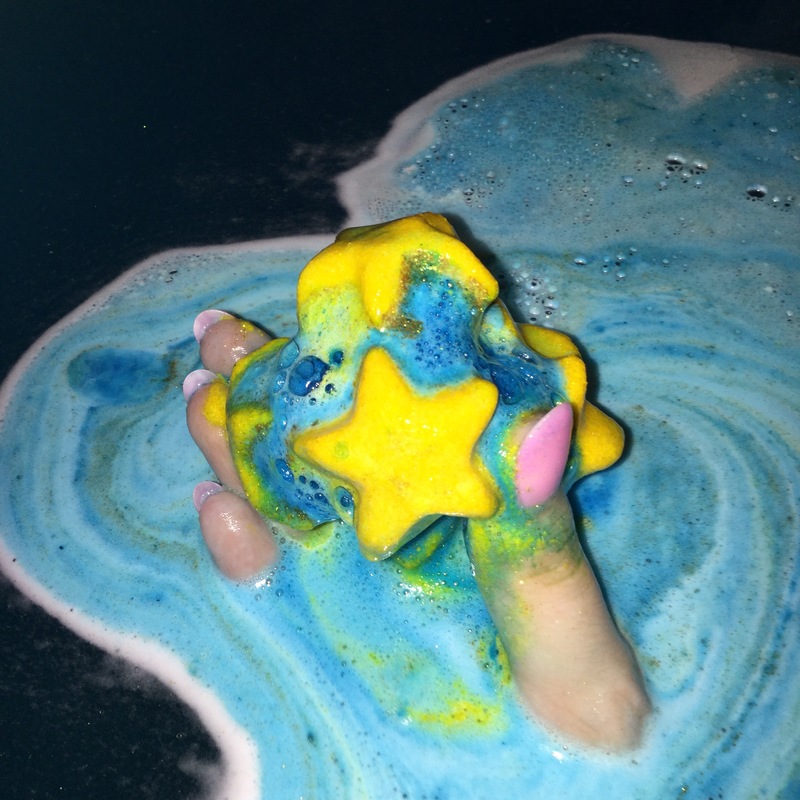 Twilight was my first Lush bath bomb and its scent is what got me hooked on Lush, any new products sharing its scent gets me very, very excited! The Lush gods had listened to me and I couldn’t wait to get my hands on a pot or three. As soon as you pop open the lid of Sleepy body lotion you are greeted with the comforting and dreamy Twilight scent. I was expecting this body lotion to be white like Dream Cream it is however a very light shade of purple. A little bit of the Sleepy body lotion goes a long way, ever since getting a pot I have been using it on my arms and legs of a night time. Have I been falling asleep quicker? Yes I have. I really do feel that Sleepy body lotion has improved my bedtime routine and from first use too. The lavender and tonka-absolute in it are perfect at helping you wind down after a long, hard day. Once applied the scent itself stays with you through out the night and most of the next day as well. You also get soft, smooth and gloriously hydrated skin which is of course an added bonus as well as all you need in a body lotion. Paired with a Twilight bath bomb and Mr Sandman dusting powder powder the Sleepy body lotion is a force to be reckoned with. I love how there are so many Twilight scented products out this winter. A few of my other favourite Twilight-scented products are the Luxury Lush Pud bath bomb, Twilight shower gel and most of all the fairly new Twilight shower jelly! I hope they decide to keep Sleepy body lotion as a permanent product as I really do not know how I ever lived without it. It’s amazing, you’ve just got to try it. When I very first see the Autumn Leaf bath bomb at the Lush Creative Showcase I was really excited. Why? because it is unlike anything Lush have created before. At this time of year and with Halloween just around the corner… (sorry guys, I hate to be the bearer of bad news but we are now very close to the 4th and final quarter of 2016) … I always find myself drowning in pumpkins, ghosts and skeletons. As much as I love the season, I think that autumn time is about so much more than just things that go bump in the night. The lack of spookiness that the Autumn Leaf bath bomb has was what first attracted me to it. At the Lush Creative Showcase the Autumn Leaf bath bombs were piled high. Even in a room that was full of hundreds of other products you could pin point the Autumn Leafs on scent alone. The Autumn Leaf bath bomb has a very refreshing, outdoorsy and earthy aroma. For anyone that loves Lush as much as me you’d know that it shares its scent with all of the products in the Grass Lush-scent family. Grass isn’t my favourite of the Lush scents so I haven’t used many of the products with its scent. The colours and design of this bath bomb however won me over, with that all in mind I feel its earthy and outdoorsy scent suits the autumn season perfectly making it a must have autumn and winter bath bomb. When you first place the Autumn Leaf bath bomb into your bath water it instantly starts to react. Pastel green foam fizzes from it, slowly decorating the bath water with a thin coat of silky-smooth foam. As time goes on other colours appear from it too. As well as the greens there are golds, reds and oranges – All of the amazing colours associated with autumn. Autumn Leaf is a very slow fizzer. It reminds me of the Skydancer Far from the Madding Guns Bath Bomb because of the way it floats, most other bath bombs float at the top for a short time before spinning, getting the whole of it wet. Autumn Leaf however stays face up, gracefully floating around the bath until it eventually all dissolves. Being honest as always, Autumn Leaf didn’t excite me once in the water as much as other bath bombs that have been released by Lush this month. This does not mean I dislike it, I still totally recommend trying it at least once. When I found out that Lush were bringing the Northern Lights bath bomb back as a product in their Winter 2016 line I was ecstatic. I was even more excited to see that it had also been redesigned, its previous shape was in my opinion more fragile than glass. Regardless of its fragility I never ever, passed up the chance to order a few when they appeared in the Lush Kitchen. 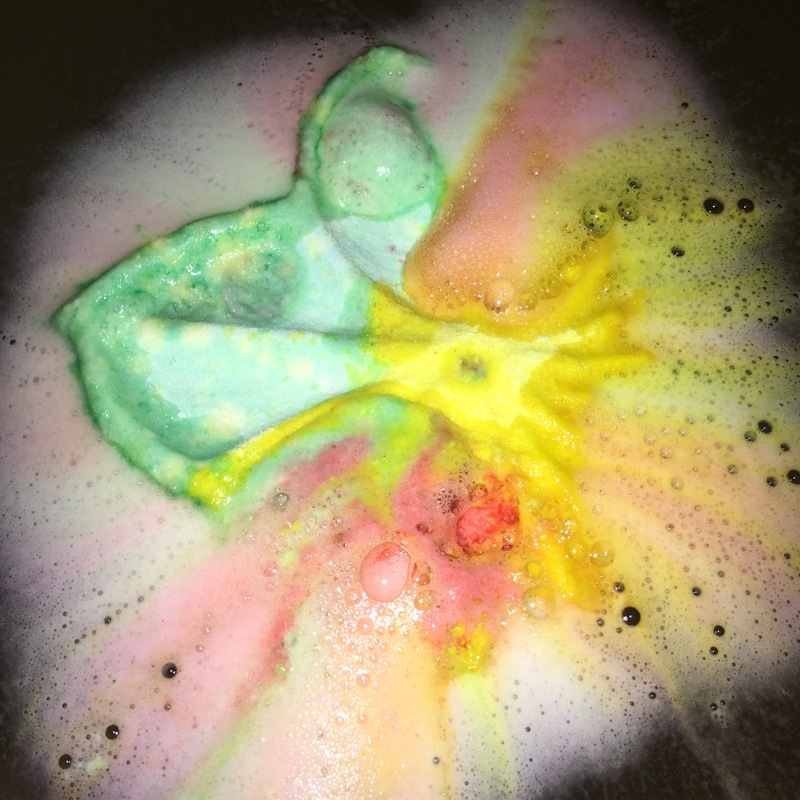 Broken or whole, the old Northern Lights bath bomb always put on a fantastic show. Above is a photograph of the newly redesigned Northern Lights. You can see a photo and my review oF the older design here. I managed to get hold of the new Northern Lights bath bomb at the Lush Creative Showcase last week so am lucky to be one of the first to try it. Scent wise the Northern Lights bath bomb hasn’t changed at all which I am really happy about. The only real difference is that it’s shortened and got a little plumper around the middle. The only other noticeable difference is that one side of the bath bomb is visibly yellow and the other blue. 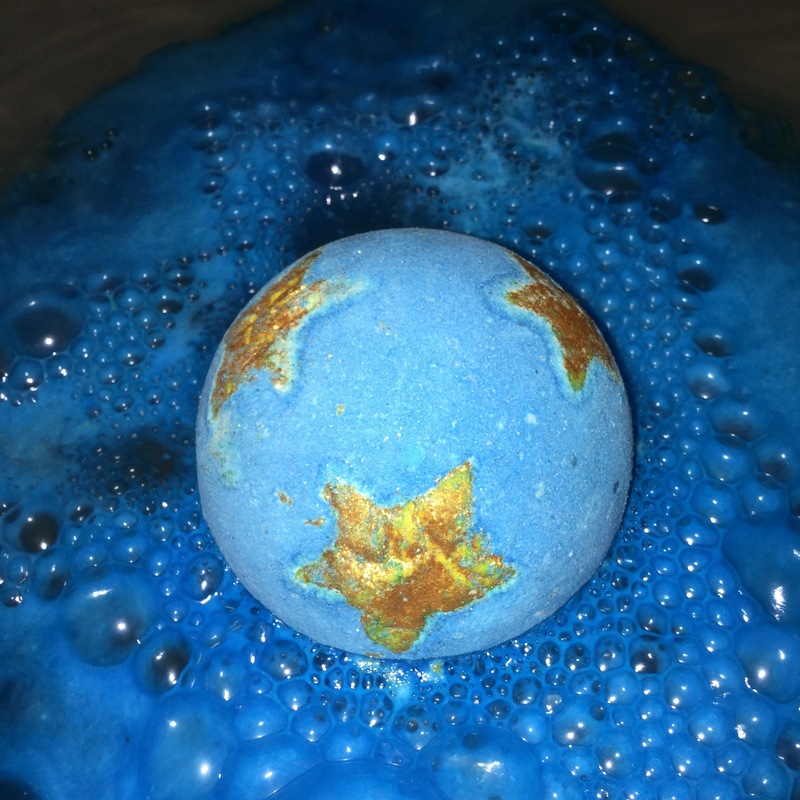 As soon as you pick up a Northern Lights bath bomb the scent really hits you, it’s not particularly strong although some may say it is because it is a very unique scent. When I first used the older version of Northern Lights it actually took me a little while to get used to its scent, once it had finished fizzing away in the bath I was however in love with everything about it including its scent. 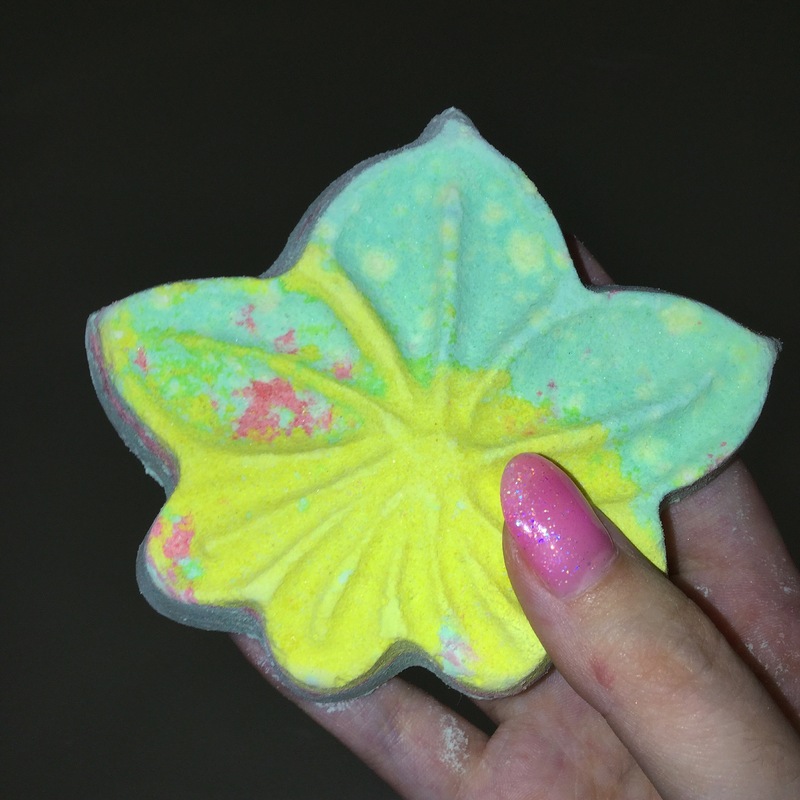 Containing Jasmine Absolute I always expected that when I first got my hands on a Northern Lights bath bomb that it would smell similar to the Sakura bath bomb. Although Jasmine Absolute is definitely in both bath bombs, they really don’t have that much in common scent wise. I’d label Sakura as a refreshing scent and Northern Lights as calm, musky and relaxing. Summed up quickly Northern Lights has a musky, floral scent. I want to also say that it’s multi-tonal too but as I have said many times before, I am useless at describing scents. It’s a beautiful scent that has depth, the more you focus on its scent, the more your nose seems to pick up. As soon as the Northern Lights bath bomb hits your bath water the most spectacular show begins. You are greeted with mounds of beautiful purple foam that is instantly followed by blue and yellow foam from either side of it too. Its scent becomes more gentle once in the water, helping you slip into relaxation, releasing any tension built up from your day. The purple, blue and yellow colours all clash so well, the bath art it creates is also beautifully spectacular, my photos do not do the bath bomb any justice, you really have to try it for yourself to truly see how wonderful it is. 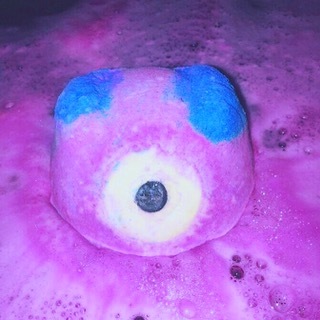 Unlike the older version of the Northern Lights bath bomb the new version of it seems to hydrate my skin a lot better. The older one I found a little drying so I am happy that the new version caters to my dehydrated skins needs. I stand by my previous statement in my first review, Lush really do need to bring out a moisturiser/body lotion with the Northern Lights scent too. I always feel so cheated when I have to add another scent to my skin, especially when I like the bath bombs scent so very much. Once in the water the bath bombs scent does soften slightly it doesn’t however go away, its scent stays with you all day through and I love how it lingers, there is no need to wear any perfume. At this point of my review on the original shaped Northern Lights, I added a plea to Lush to rethink the bath bomb’s shape. Lush obviously listened to all of our concerns otherwise I wouldn’t be writing this now. The big question is, is it better than the older version? It is far more robust and everything that needed tweaking slightly haS been tweaked taking it from being a lovely bath bomb to a perfect one instead. I can’t quite remember what colour the bath water of the older version was once the bath bomb had all fizzled away, I think it was a blueish purple. The new version however leaves your water an emerald green. Which was another great surprise for me. 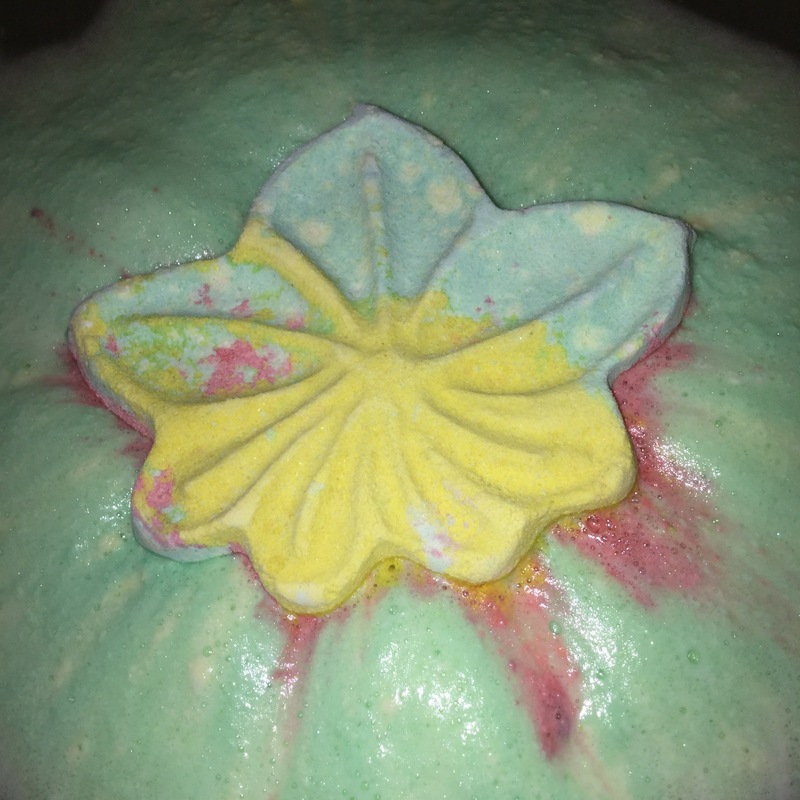 The Northern Lights bath bomb really is bath time magic, it has hypnotic colours and the most relaxing aroma. It really is a crime that Lush Cosmetics don’t have any more readily available products sharing its scent, here is my second plea to Lush… Please can we have a shower gel in its scent? A Northern Lights shower gel would really, really make me the happiest Lushie in the world! it would be amazing right? When I see that the So White Bath Bomb had, had a makeover I was a little worried as the older version is one of my all time favourites. When presented with the new So White I was relieved to find that its scent remained the same as the original. The new So White bath bomb is now shaped more like an actual apple. It has an indentation where the apples stalk would be if it was a real apple and also a single green leaf on its top. One more difference I could see was that instead of also being completely round, the new So White bath bomb now had one flat side making it more stable if put on display. I’m not sure why some bath bombs have this and others don’t as I’ve never thought to ask. Above is a picture of the new So White bath bomb next to its older design. When I got home and compared both of the designs together I noticed that the newer one also felt a little lighter. The old design had quite a sturdy, solid exterior; One that reminds me of a gob stopper. The new So White however has a much softer and almost dusty shell, which normally means it is coated with Lush’s foaming agent meaning more froth once in the water! There was only one way to find out if any more had changed so I put my new So White in the bath, camera at the ready. It instantly began to foam lots and lots of white. The older version after a few seconds would then start to show its pink exterior. After a minute or so I noticed that there was no pink. It was at that point that the bath bomb began to spin, dunking its one green leaf under the water creating one very small puff of apple green foam. By this point I was wondering if the bath bomb had a coloured center at all. The older version was pink throughout but the newer design seemed to be white all through. 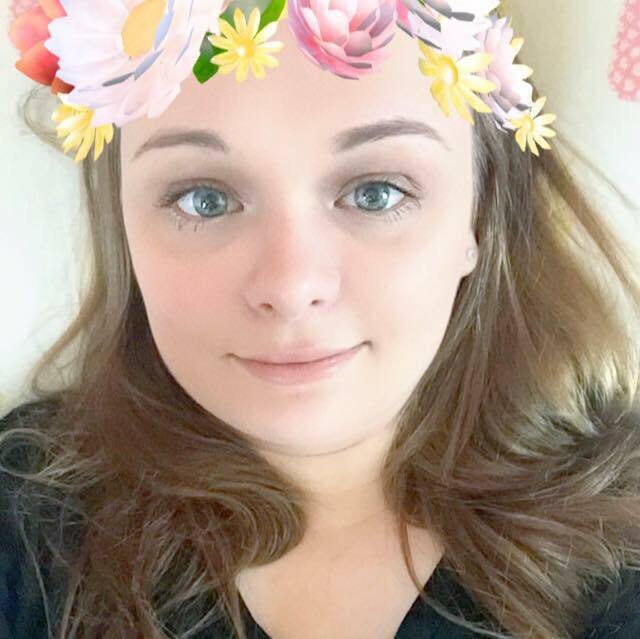 Pink is my favourite colour so I was a little disappointed. Just as I was about to sit back in the bath thinking that the bath bombs show had already finished the bath bomb suddenly spurted out yellows, blues and greens! The new colours really did surprise me. When you’re used to a soft pink exterior you really are surprised to see other such vibrant colours appear. The colours hidden inside the new So White bath bomb are similar to those of the Fizzbanger bath bomb. The introduction of these bright and zesty colours well made up for the absence of its previous pink interior. The scent of this slow dissolving bath bomb like its older design still allowed my imagination to run wild. The sweet scent of fresh, crisp apples will always be welcome in my bathroom. After getting out of the bath I could still smell the scent of the So White bath bomb on my skin, the new version was just as good scent wise and my skin felt hydrated and super smooth. I never think it is possible to improve upon perfection but Lush Cosmetics go above and beyond my expectations of perfection every time. The newly redesigned So White bath bomb is yet another new Lush product that’s going to drain my bank account of funds. Will Lush ever release a product I don’t like? !